Tonight it wasn’t just the sky that was filled with electricity. 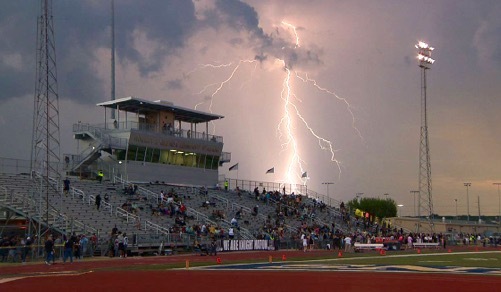 The Steele Knights were about as powered up as the lightning bolts coming down around Lehnhoff Stadium prior to the game’s start. We began the game strong, driving swiftly down the field and scoring our first touchdown just a little over 2 minutes into the game. And it didn’t stop there. The Rangers fumbled the return, and it was Knights’ ball on our 9 yard line! Less than 2 minutes later, we secured our second TD of the game, bringing the score to 14-0 with 8:45 left in the first quarter. Another huge play, again, literally only minutes later, Steele intercepted a Ranger pass! And unfortunately they then intercepted it back, but we held them, they were unable to score, and we answered with yet another TD. The next big highlight that I happened to catch in between all of the kid drama, came in the form of one of those “spiral-from-God-sent-straight-into-the-upper-regions-of-Heaven” passes which brought us to 10 and goal which also turned into a TD not too much longer after that. At this point I was getting more and more distracted by my small people. Basically the Knights were unstoppable. Final score, 42-16. It was awesome! I feel like there’s so much more to say about the kids, but frankly, it’s almost 1am and I’m exhausted (and have a 5k in the morning). In summary, if you touch Rex, he’s about as sticky as a piece of duct tape from all of his lollipop drool, Landri is covered in hot pink play-dough, and Ty Baby has crusties in his neck. The theme? My kids all need a bath! But we survived another game though!! Thank you to my massive support team – I could not make it through a game without all of you! Previous Post Treat. Yo. Self.